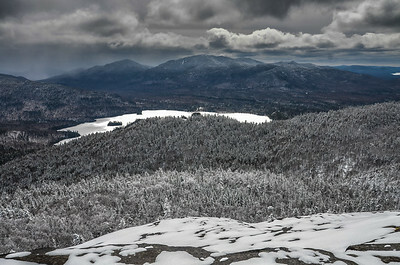 Ampersand Mountain stands at 3,352 feet tall and sits just west of the Adirondack High Peaks. 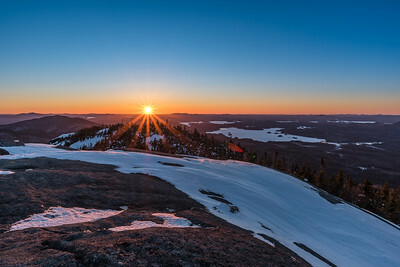 It is one of the Saranac 6ers and a more popular mountains in the area, offering outstanding views of the High Peaks to the east and the Adirondack lake country to the west. The trail is moderate in difficulty, climbing 1,800' over 2.7 miles. From the parking lot on Route 3 there is a short trail leading to a beach on Middle Saranac Lake. During the warmer months of the year it is a great place to take a dip after hiking Ampersand. 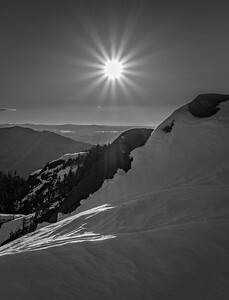 Sunset from the summit of Ampersand. Looking toward the Seward Range from Ampersand.